SFW205FWC Digital Fire/Water Safe is rated 4.1 out of 5 by 15. 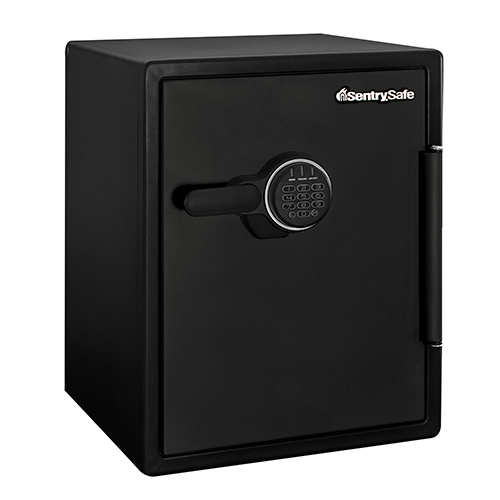 With six large, one inch bolts and a pry-resistant hinge bar, this Digital Water and Fireproof Safe is an ideal storage solution for important documents and valuables. A backlit digital lock allows you to easily access your items, while solid steel construction and a pry-resistant hinge bar work hard to protect against unwanted entry. Rated 5 out of 5 by djhanson from Good home safe Easy to program your own code. Wide enough for letter size files. The compartment on the inside door will hold a legal size document, such as an abstract. The two provided slide drawers are nice for misc. items. My only concern is whether the electronics will hold up over time. LED lights that illuminate the interior when the door is open is a nice touch as is the lighted keypad, especially if you prefer to have the safe in an out of the way place. Rated 4 out of 5 by FRANK KAMPEL from Interior dimension Overall I like the safe. I am disappointed that the actual interior width dimension is not what the product specification indicates. The actual useable dimension is less than the stated dimension. The stated dimension is 14.8 inches but the tracks on each side used for the shelf and the “tub” reduces the useable spaces. Disappointing since I had planned to store my laptop flat in the safe but now I can’t. Otherwise I like it. Rated 1 out of 5 by eagle 1997 from Useless Brought from a local trade warehouse in the UK, spent 3 hours trying to get the door open. Managed to open it twice by putting the safe on its back, stand on it and yank it sharply using my strongest son. totally useless, fine if you plan to load it up and never touch anything again. took it back the next day for a full refund. Please scan the reviews on the internet, mine was not the only door problem reported. 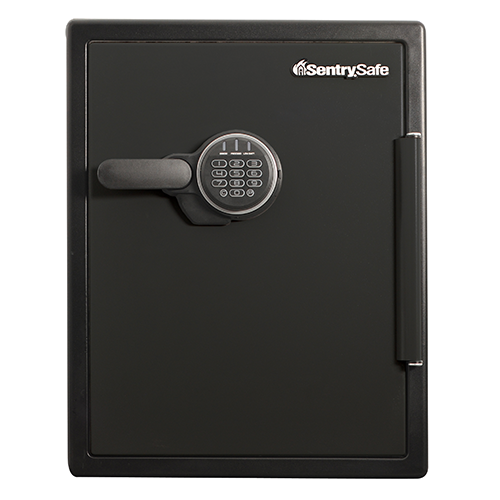 Rated 4 out of 5 by NelsonM from Sentry fire and water proof safe Perfect size, water and fire resistant. Handle does not seem very substantial or sturdy. No problem with handle, just not what I am used to. Very attractive interior. Would definitely recommend for its value. Would have preferred left hand opening door but not sure if that was even available. Rated 4 out of 5 by billh from Large, Strong, Secure, Fire & Water Proof Safe. 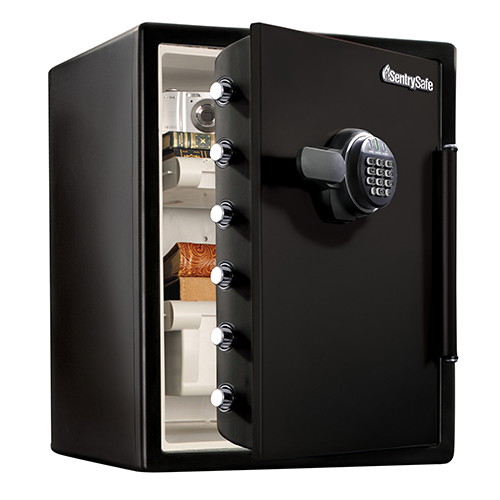 This safe provides excellent space for storage with the theft, fire and water damage security to preserve all types of documents. There are multiple shelf positions and plenty of room for files. 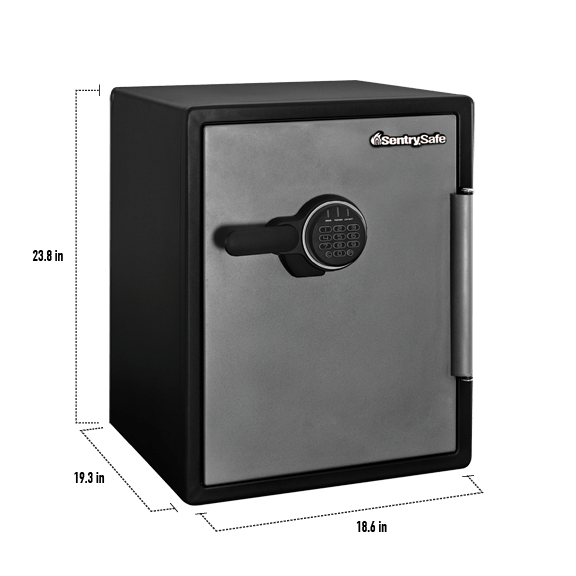 Rated 5 out of 5 by RB18 from A great home safe This safe will allow us to protect important documents and other items at home vs. paying for a safe deposit box at the bank. Everything to date is working just fine. Rated 4 out of 5 by Brian S from works well Menards had it as cheep as anywhere.I don't know what else they want me to say to fill their minimum character requirement.